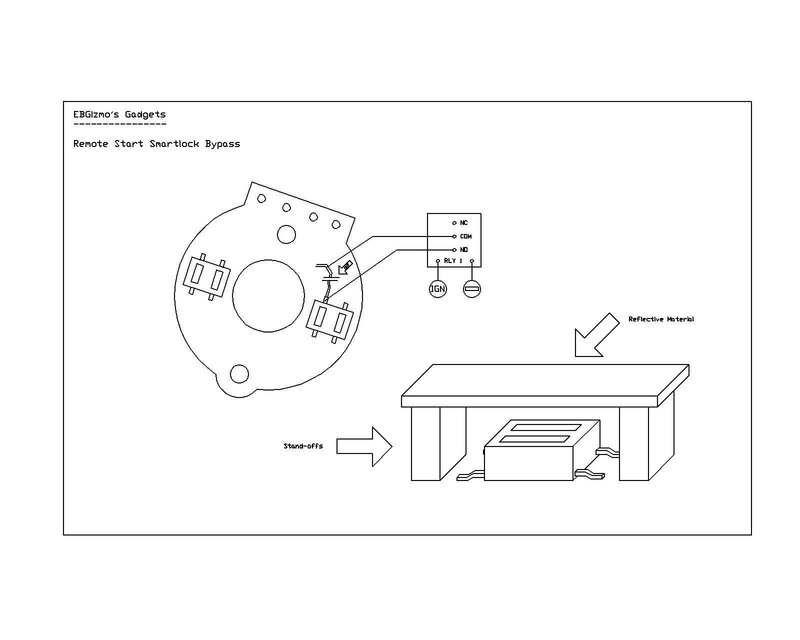 This document describes how to perform a modification to the pcb that is internal to the locking barrel on the EB-EL etc models to allow for easy installation of an aftermarket Remote Start Module. This mod will make the smartlock code PCB EXTERNAL to the barrel locking mechanism, and as such, will RENDER THE FACTORY SMARTLOCK SYSTEM LESS SECURE! So you decide if you wish to continue to fit this modification to your car! FORDMODS takes no responsibility if you continue reading and completing this modification. The information will not include any methods for breaking open the barrel, as this would border on something we do not want to encourage here on Fordmods.com - vehicle theft. This document will only focus on the modification to the PCB, and the relay that will control it from now on (instead of the key). If you require assistance in disassembling your lock, I would suggest taking it to someone with a little workshop experience, as the process is relatively simple with the right tools, but nothing too complicated. Once you have removed the PCB from the lock, the lock can be reassembled and used as normal, for starting etc, and to lock the steering wheel. Whether you do this to your existing barrel, or buy a spare one from a wrecker, is up to you. Other mods that perform a similar task have involved using an existing barrel that always has the key inserted, and turned to the IGN position. Thereâ€™s nothing wrong with this method, as long as you have a place to put your extra barrel, and this method does in fact keep your PCB nice and safe inside a barrel. After you disassemble and remove the switch section of the barrel, you'll find a circular PCB inside, and a rotating white disc made of plastic, which is turned by the key mechanism. The PCB has 2 Infra red transmitter/receiver sets on it. The key barrel is connected to the white plastic disc that reflects the transmitted IR back on to the sensors. Identify which IR set is used for the ignition only reflection, IR Set B (See pic for details) The IR sets are the little black "box" shaped items , labeled with red circles in the pic. They will appear to have 2 little "slits" or windows on them. One "slit" is a transmitter, the other is the receiver - all in one single surface mount unit. It will be soldered onto the PCB via 4 pins, 2 solder legs for the transmitter, and 2 solder legs for the receiver. Using a sharp knife, simply cut ONE trace going to ONE of the pins, so you are breaking the electrical path to only ONE of the pins. It doesn't matter which pin you select, but do the pin that has ample room to solder wires to later on. If you look at the pic, you'll be able to see which one I have selected. 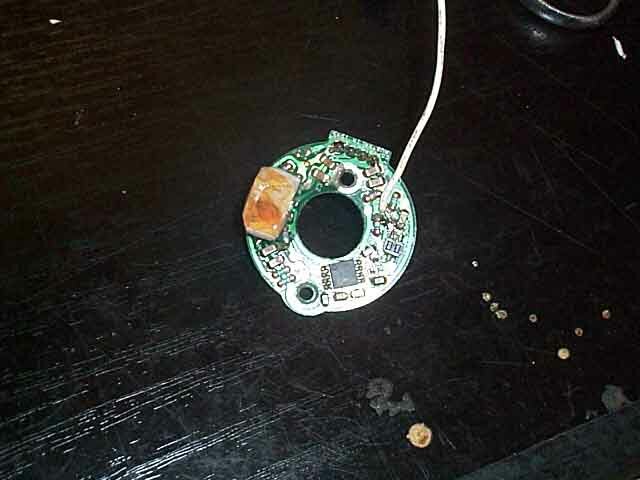 I have only soldered on one wire in that pic, so as I explained earlier, you will have to determine for yourself where to solder the other wire. I would very much love to have someone supply me with a scan of their PCB so I can positively identify where the wires need to be soldered, but if you look at the pic, one will be soldered to the pin itself, the other to the track that WAS going to that pin. Now scrape off some of the green solder masking from the track you just cut, and solder a wire of small gauge to that track. Now, solder another wire to the pin that WAS connected to that track. See the illustration for an example. The IR Sets are sensitive components, so don't leave the soldering iron on the leg for too long or you risk damaging the PCB or IR. Now, decide where you are going to mount this PCB and relay. I would suggest buying a small Jiffy box from jaycar and housing both in there, and sticking it up under the dash somewhere where it can't be accessed. Work out how long you will need the wires by looking at the final schematic below. Connect one of the new wires to the common, and the other wire to the normally open pole of the relay, and power the relay from any IGNITION source (not accessory, or it won't work). The next step is to make both IR sets continually reflect, replacing the job of the white disc. Grab a piece of white plastic from somewhere, such as an ice cream container, or shiny white cardboard or playing card. Anything reflective will do, but don't use a mirror, as it will reflect back into the emitter and not disperse the IR like the plastic does. Glue two supports to either side of each IR set (I used small blocks of pencil eraser). Make sure the supports are not made of a conductive material, or you'll short out the PCB. What you are going to do is glue the reflective plastic you sourced to the top of the IR set at the same distance from the IR sensor that the original disc use to be. Its not absolutely critical that they be the same, but there does need to be some gap, so make your eraser "stand offs" roughly this height, and glue the plastic to them, forming a reflective "roof" over the IR's Do this to both IR's. Only one will get the signal to reflect all the time, the other (the one you cut the trace on) will only reflect when the ignition comes on, and the relay closes. Wire it all up as per the schematic and you're all done! Check that everything works, install your remote start and enjoy! Document written by: EBGizmo on 27 2007>, Copyright © 2007 EBGizmo, all rights reserved.